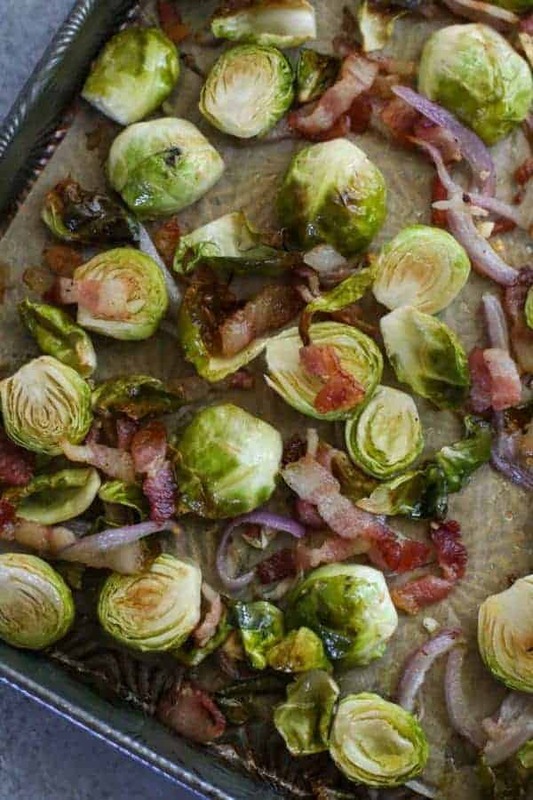 Bacon and Brussels and Garlic, oh my! 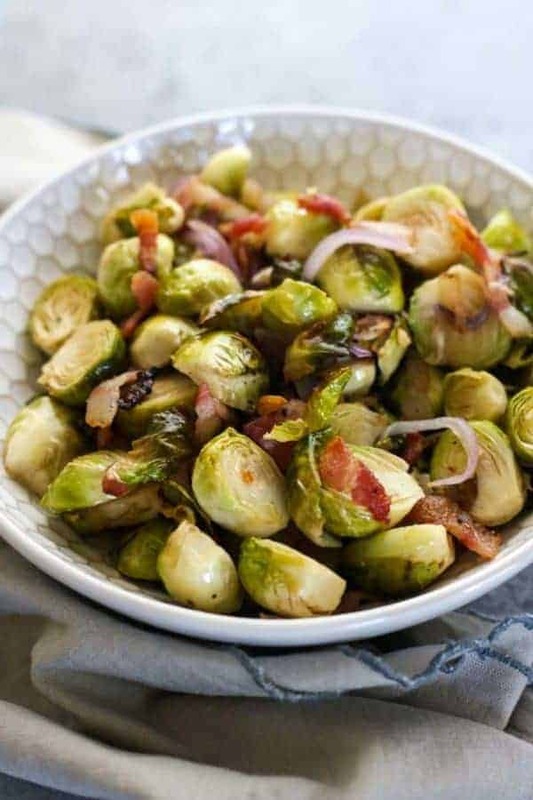 Whether you’re in the midst of a Whole30 or not, you’re going to love these Roasted Brussels Sprouts with Bacon. And not just any bacon — we’re talking about uncured, nitrate/nitrite-free and sugar-free hickory smoked bacon. Real bacon, with all it’s fatty bits that make everything all smoky and salty and irresistible. Not only is this bacon sugar-free, it’s also free of added nitrites and nitrates, is MSG and gluten-free and the pork used to make the bacon is humanely raised. This is a really big selling point for me because I like to be able to look my food in the eye and when I can’t, I want to know that the animal was raised on a farm that’s self-sustaining and good stewards of the land. It’s also important to me that the meat I consume has been allowed to live a good life, free of stress, eating it’s natural diet with access to fresh air and the outdoors and without the use of growth hormones or antibiotics. That’s exactly what I’m getting when I serve up a plate of Pederson’s Natural Farms bacon to my family – and for me, that’s the next best thing to buying from my local farmer. Brussels for the nutrition win! Brussels sprouts, a member of the cabbage family, are a great source of vitamins C and K. And they’re also a good source of folate, manganese, fiber, choline, copper, vitamin B1, potassium, phosphorus,vitamin B6 and omega-3 fatty acids. They’re also rich in antioxidant and phytochemicals and have been shown, like other cruciferous vegetables, to have anti-cancer properties. They also taste delicious and even more so when roasted with plenty of garlic and bacon so let’s do this! Remove any damaged or tough outer leaves from the sprouts, trimming the bottoms if necessary and cutting them in half. Place on a large baking sheet lined with parchment paper. Add sliced red onions and garlic. Drizzle with avocado oil and toss to coat. Sprinkle uncooked bacon and salt and pepper over all. Place pan in oven and roast, baby, roast until delightfully crisp and lightly caramelized. Serve and prepare to fall in love. These tiny cabbages are turn into something magical with the addition of crisp, salty bacon and they’re an easy side dish for any meal. 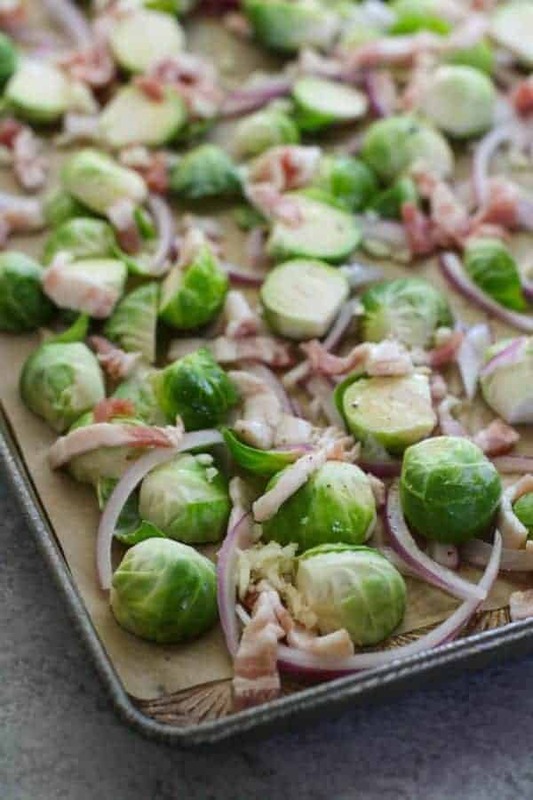 Place trimmed Brussels sprouts on a parchment-lined baking sheet. Place in oven and roast for 20-30 minutes, stirring halfway through, until Brussels are tender and bacon is cooked through. 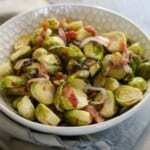 What’s your favorite way to prepare Brussels sprouts? Tell us about in the comments below! This post was made possible by our friends at Pederson’s Natural Farms. Through we received compensation for this post, the opinions expressed here are 100% our own. Thank you for supporting the great companies we works with thereby allowing us to continue creating great recipes and content for you. YUM! 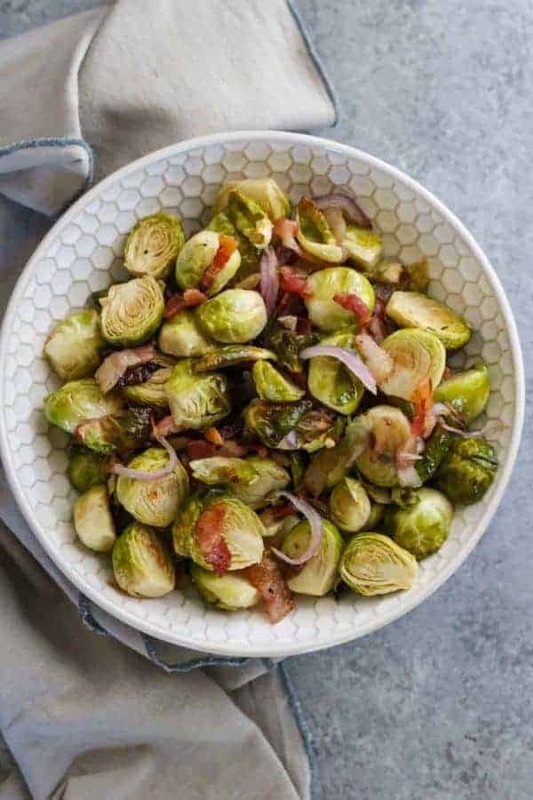 I make my Brussels nearly identical to this recipe – the only additions are crushed red pepper flakes, and a drizzle of ACV when they come out of the oven. They’re addictive!!!! I love them for breakfast with a couple of scrambled or fried eggs. Whoa! Crushed red pepper flakes and ACV are a game changer – thanks for sharing, I need to try that next time I pull these out of the oven.